John R. Durso, President of The Long Island Federation of Labor, AFL-CIO, said today that the labor organization representing 250,000 working men and women and their families along with the overwhelming majority of New Yorkers fully supports raising the minimum wage to $15 an hour. The Labor Federation strongly disagrees with the findings released by the Long Island Association suggesting it will cost jobs on Long Island. Numerous studies disprove the contention by business leaders that raising the minimum wage costs jobs. “It’s time to stop subsidizing low wage employers” Durso said. “It’s time that tax payers and the hard working families were no longer forced to foot the bill for employers paying poverty wages. The amount gained in payroll and income taxes and saved by providing less public assistance would produce savings for our state and municipal budgets.” The United States of America is a consumer driven economy, where over 70% of our spending is consumer based. 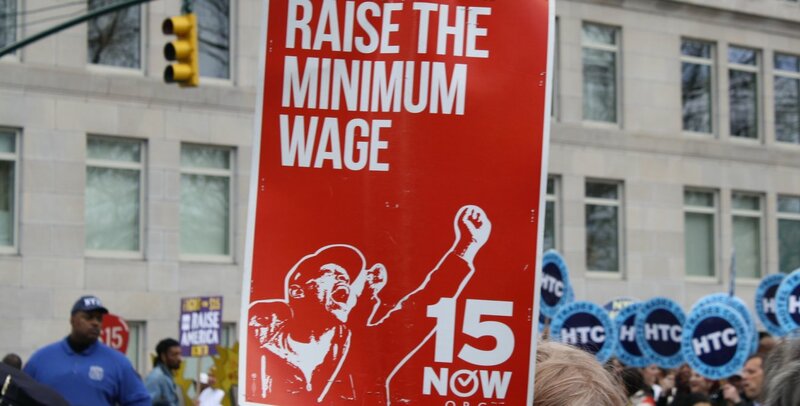 Studies by the Fiscal Policy Institute, the National Employment Law Project the Economic Policy Institute and countless other organizations have underscored the economic benefits of raising the minimum wage.